Premiering: Wednesday, Feb. 4th at 7:30 p.m. (central) followed by another new episode at 8:30 p.m.
ABC has a history of rewinding to the formative years of kids who survived their nuclear family upbringings without self-imploding. The network’s most famous entry, The Wonder Years, tracked earnest Kevin Arnold’s boyhood longings from the late 1960s to the early 1970s. Daniel Stern narrated as the grown-up Kevin. In fall 2013 came The Goldbergs, set in the 1980s and viewed from the perspective of bespectacled youngest son Adam Goldberg. Patton Oswalt narrates as the adult Adam. Next up is Fresh Off the Boat, the saga of chunky Eddie Huang’s fish-out-of-water travails, circa 1995. The real-life Eddie Huang does the voiceovers. Unlike its predecessors, Fresh Off the Boat is no slice of white bread, even if 11-year-old Eddie (Hudson Yang) demands “white people food” after the Chinese lunch he brings repulses his new classmates at Abraham Lincoln Middle School. So off they finally go to the Food 4 All store, which “looks like a hospital” in the view of his mom, Jessica (Constance Wu). Both Eddie and Jessica are very much against the family’s move from Washington, D.C.’s Chinatown to suburban Orlando, FL, where aspiring dad Louis (Randall Park) is trying to turn the Cattleman’s Ranch Steakhouse into a thriving eatery. Its decor looks like a taxidermy convention and the lunch/dinner crowds can be counted on one hand. Louis’s initial strategy is to hire a doofus Caucasian host named Mitch (Paul Scheer). Or as he puts it, “a nice happy white face like Bill Pullman.” This does not work. Fresh Off the Boat is getting the best comedy showcase ABC can provide, with a sneak-preview episode Wednesday following The Middle and a second new half-hour after Modern Family. It will then be off to Tuesdays at 7 p.m. (central), where the failed Selfie used to reside. There are some grins to be had here, with Park and Wu well-cast as parents with disparate temperaments. Louis Huang aims to please while envisioning an eventual better life for the entire family. Jessica is skeptical, tradition-bound and hard-pressed to look on the bright side. In Wednesday’s second scheduled episode, subtitled “Home Sweet Home School,” she cracks down hard on any extras for restaurant customers or staff. Forget about an additional paper napkin and stop sneaking croutons from the salad bar. 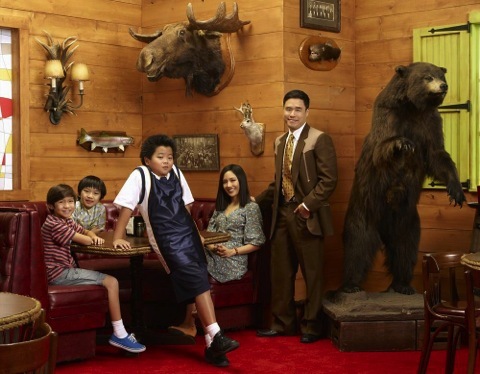 The Huangs also have two younger sons, Emery and Evan (Forrest Wheeler, Ian Chen), both of whom have an easier time assimilating than big brother, Eddie. Live-in Grandma Huang (Lucille Soong), who gets around in a wheelchair, occasionally pops in as an ally of her put-upon grandson. The series further strengthens ABC on the diversity front during a season where it’s also ushered in black-ish and Cristela. This is laudable, but it also would be a good idea to write out the white stereotypes. Principal among them is a quintet of giggling, ditzy white women neighbors who befriend Jessica while also condescending to her. Desperate housewives without any candle power? This would not be acceptable if all of these women were black and loud and stupid. A subsequent episode, “The Shunning,” introduces a suburban home wrecker named Honey (Chelsey Crisp), who’s despised by the gaggle of dummies but enlightened when it comes to enjoying Asian food and accepting Jessica for who she is. Eddie appreciates her for other reasons at a Daytona 500-themed block party in which Louis strives to publicize Cattleman’s Ranch. Fresh Off the Boat paddles hard in its efforts to be an amusing comedy with heart. So far, the parents -- not the featured kid -- are the primary reasons to watch. That may not be the way it was drawn up. But it beats coming up short all around.